Andrew Love Of The Memphis Horns Has Died : The Record The saxophonist, who paired with trumpeter Wayne Jackson to form the Memphis Horns, played on dozens of the biggest soul hits of the 1960s and '70s. He died on April 12. Andrew Love (left) and Wayne Jackson pose for a studio portrait in 1965. Saxophonist Andrew Love of the Memphis Horns has died. Love, who had Alzheimer's disease, died on April 12 at his home in Memphis. He was 70 years old. 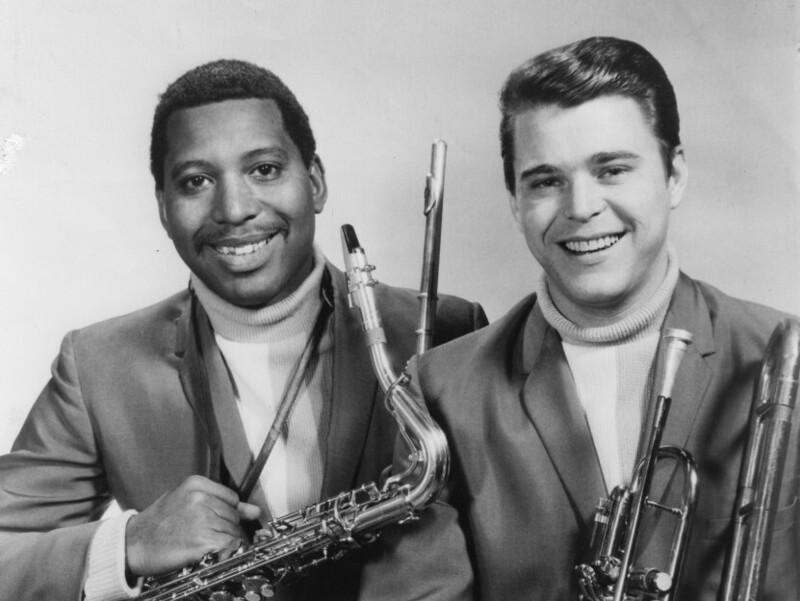 For a while, there were other players in the mix; but ultimately, Andrew Love and his partner, trumpeter Wayne Jackson, were the Memphis Horns. The duo put the muscle in dozens of great soul hits from the 1960s and '70s: Otis Redding's "Try A Little Tenderness," Al Green's "Let's Stay Together," Aretha Franklin's "Think," Dusty Springfield's "Son of a Preacher Man." The list goes on and on. Jackson was a short white guy, the son of an insurance salesman. Love was a tall black guy whose father was a preacher. Despite the racial tension in the 1960s and '70s, Love and Jackson's partnership thrived. In 2003, Love told NPR, "Musicians are musicians. ... If you can play, you're alright with me." Love's career began as a session musician for Willie Mitchell's Hi Records. According to Robert Gordon, author of It Came From Memphis, Love was Mitchell's favorite sax player. Gordon says that because Love couldn't afford a phone, he moved his wife and child to a small apartment across the street from the studio, "so that when Willie Mitchell would need him for a session, Willie could come knock on the door and say, 'Andrew, c'mon and play.'" Meanwhile, Jackson was a session musician for Stax, the rival studio across town. The two met playing gigs in nightclubs. Jackson says the first time he heard Love, he was hooked. "When I heard him it just knocked my socks off," says Jackson. "He had such a big, wonderful sound. I knew he would be my perfect partner." Eventually, Love left Hi Records for Stax, and he and Jackson started working with artists like Sam & Dave, Redding and Isaac Hayes. The Memphis Horns, as they began to call themselves, were so hot in the '60s, other studios and artists came calling. But Stax wanted exclusivity. So Love and Jackson did something most musicians at the time were too afraid to do: They left and started freelancing. "We needed to be making money every day with those horns," says Jackson. From Al Green to U2, their discography is astonishing. For nearly 50 years, Love and Jackson played together, at times, every single day. "He was the coolest guy I ever knew," says Jackson. "And by cool I mean smooth. Smooth with life. Smooth with his kids. Smooth with me."